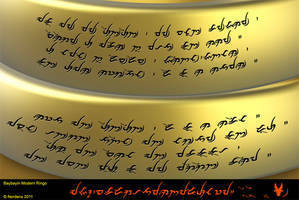 I needed an illustration of the Laguna Copperplate Inscription (LCI) for my book so I created one. May I use your image? I am making a video backdrop for a school play. i need an indonesian from bali for this. 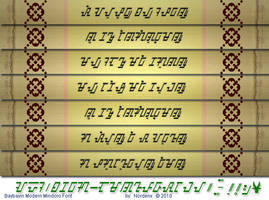 Hello Norman, I just want to thank you for your Baybayin fonts, the designs are quite artistic and interesting. This also deepened my interest in ancient Philippine culture. I heard you speak once in Ateneo during the PICCA Festival 2011 when you were promoting Anak Bathala and you mentioned your Baybayin site. Whenever I use the fonts, I always acknowledge your site as the source. Keep up the good work, and I am always proud to be a Filipino, and much prouder now because of your work, and the work of our fellow countrymen in this field. Maraming salamat Kabayan! Mabuhay ka! Thank you for your kind words and you're welcome. May you have good luck in all your endeavors. Cheers! Kasaganaan at kapayapaan para sa iyo, Kabayan. Oo, naman. 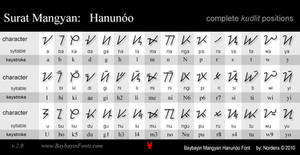 It took experts to decode it and it was a mixture of Sanskrit, Old Javanese, Old Malay and Old Tagalog. Plus, the inscriptions have been damaged by time, nature, and circumstances. so kuya may complete translation ng scripture?? Antoon Postma learned that the inscription was a pardon from the Chief of Tondo that erased the debt of a man named Namwaran. His debt was one kati and eight suwarna, or about 926.4 grams of gold. Hope you had a great holiday too.